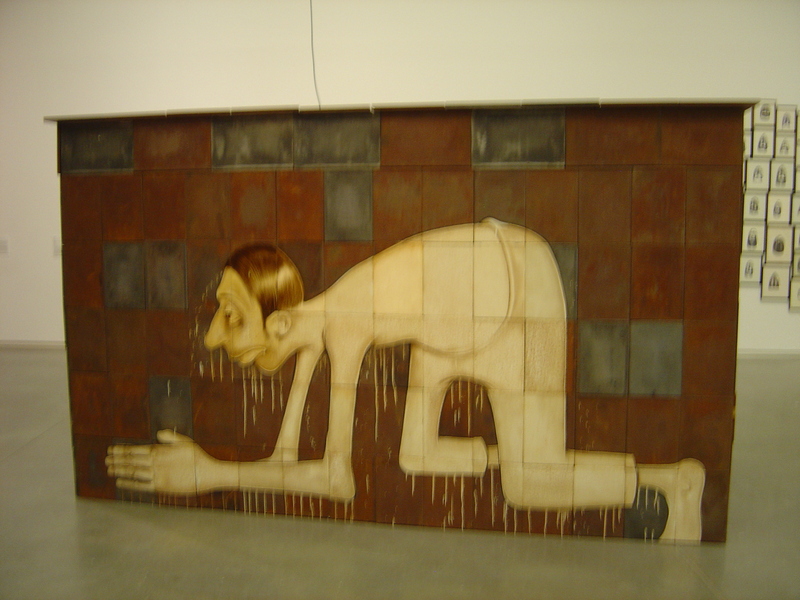 Barry McGee (aka Twist, his street tag) also uses the personas of R. Fong and Lydia Fong. McGee’s art has been described as “Mission School” (after the San Francisco Mission District) and “New Folk” but I’ll just call it street art. McGee’s art brings together graffiti, comics, hobo art, sign painting and surfing. His art on the street or in the gallery has clean lines and he uses a blocky sans-serif font with drop shadows. His art is based around grouping and clustering materials and images. He is inspired by the eclectic mix that is found in bodegas and on the street. McGee enjoys working collectively and collaboratively. There are collaborations with his long time collaborator Josh Lazcano, his late wife Margaret Kilgallen, or his collaboration with Boston graffiti artists for this exhibition. You can enter this retrospective from two directions at the ICA. You can start with McGee collaborating with local Boston street/graffiti artists to create his own exhibition (for more on Boston graffiti see http://www.bostonsgraffitighosts.com). Or you can start where the curators started. The curators mention that there is a “central contradiction” in McGee’s art between the street versus the museum. I don’t know about that, museums/contemporary art institutes are (or should be) just place to display art, whatever it is rather than the art having to conform to the institution. McGee is not a naïve, outsider artist – he studied art the San Francisco Art Institute in the late ‘80s and early ‘90s. And McGee can easily fill whole gallery walls as easily as he can fill walls on the street. 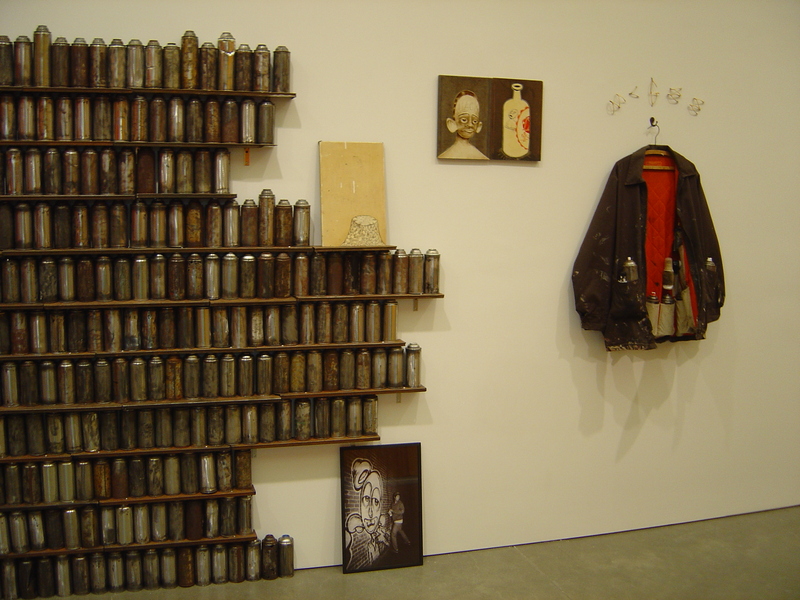 In one gallery an animated wooden head repeatedly bangs against a bulging wall of scrap plywood. Maybe the central contradiction that McGee explores is between kitsch versus tasteful, quality versus junk, good versus bad art. There is along with all the images, sculpture, junk and stuff a lot of sound in the exhibition, the animatronic spray painting figures squeak, there is tower of televisions – it is not a silent tomb of an exhibition. I took some time out from walking around the exhibition to sit down in the Poss Family Mediatheque to take another look at the art of McGee in videos, photographs and text on an interactive screen while looking out the window to Boston’s bay. This gave more depth to the exhibition and meant that I wasn’t on my feet the whole time. “I can live with the rats but I can’t live with graffiti” says a local resident quoted in The Boston TAB 7/8/90. You can get diseases from rats, like the plague, but I’ve never heard of anyone dying from exposure to graffiti. In the NYC flat that I was staying in last week the cat was sitting proudly behind the cockroach that it had killed. The constitution of the USA does not include private property as an inalienable right; the inalienable rights (those that a person cannot be alienated from are life, liberty and the pursuit of happiness). Life, liberty and the pursuit of happiness seems like surfing and the art of Barry McGee. 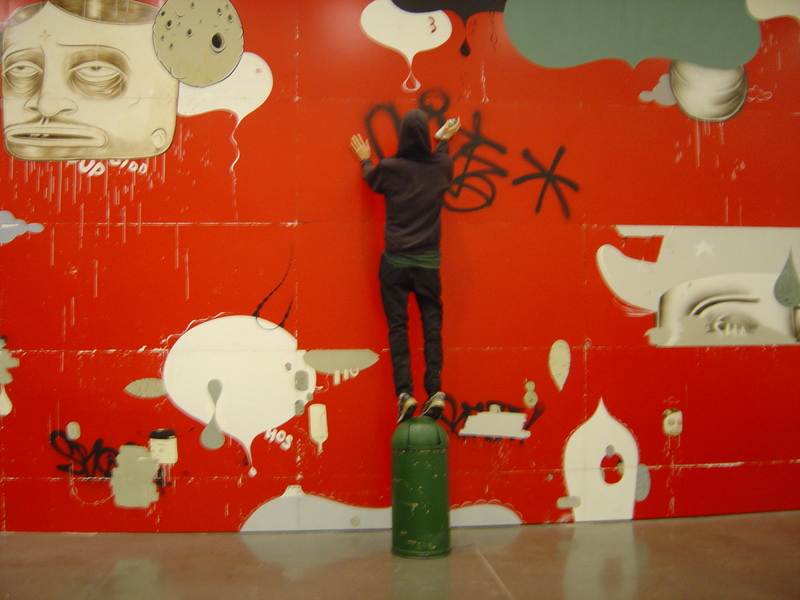 This exhibition at the ICA Boston is billed as “the first-ever retrospective of acclaimed artist Barry McGee” expecting that there will be more, I hope there will be. This entry was posted on Monday, May 6th, 2013 at 10:41 PM	and tagged with arts, Barry McGee, Boston, Boston ICA, graffiti, margaret kilgallen, san francisco art institute and posted in Art Galleries & Exhibitions, Street Art, Travel. You can follow any responses to this entry through the RSS 2.0 feed.